This homage to 19th century literature takes place in a small New Zealand gold rush town, where the newly arrived Walter Moody stumbles upon a clandestine meeting between a dozen men, including a priest, a druggist, a hotelier, a Maori warrior, and a pair of Chinamen. In turn, the members of this unlikely assemblage narrate to Moody the recent spate of events that have brought them together: a hermit's death, a prospector's disappearance, a prostitute's near-fatal overdose, a missing fortune in pure gold, and the recent arrivals of an ambitious politician, the dead hermit's mysterious wife, and a scar-faced ship's captain. Eleanor Catton brilliantly unfurls all of these interconnected plotlines via her richly drawn and fully inhabited characters. Though epic in length, I tore through this novel. Catton's Booker Prize was well earned. 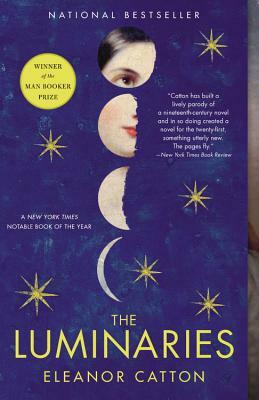 Eleanor Catton holds an MFA from the Iowa Writers' Workshop and an MA in fiction writing from the International Institute of Modern Letters. She lives in Auckland, New Zealand.